IAM Members of Local 1297, District 54 employed at Vesuvius USA Corporation overwhelmingly ratified a new five-year deal on Friday, September 28, ending the brief, but effective strike. The strike came after members voted unanimously to reject a so-called last, best, and final offer from the employer that made draconian cuts across the board. The new accord, ratified by a 3-to-1 margin, features a wage increase of nearly two percent over the life of the agreement, and tremendous improvements to the 401(k) savings plan match. The plan will increase to a 7.5 percent match, with a 4 percent total yearly gross salary match that will also be dropped in their 401(k) plan once a year. On October 1, a $2,000 lump sum drop-in will also be added by the company. In addition to the 401(k) increases, an Early Retirement Agreement (ERA) was added for employees 61 and over. The Negotiating Committee also beat back attacks on healthcare, removing a proposed surcharge for spousal coverage. The new contract will go into effect immediately, and the workers reported to work as normal on Monday, October 1. The 401(k) savings plan is in the top 3 percent in the country, and as a result, several eligible members took steps immediately Monday to put their retirement in motion. The senior-most member doing so is estimated to receive more than $60,000. The company also called back all workers currently on layoff and plans to hire nearly a dozen more, replacing all members taking the improved retirement. 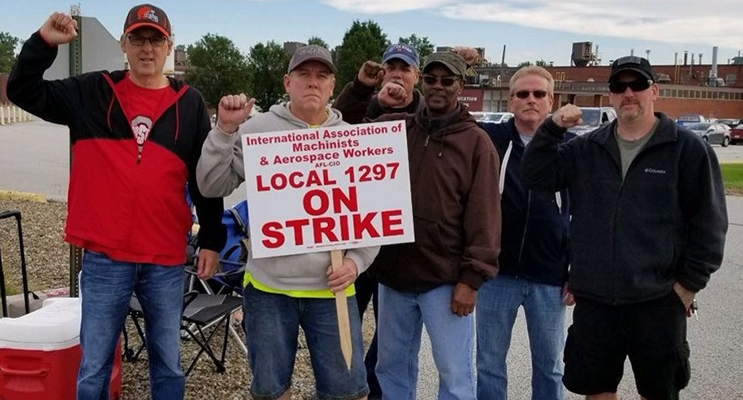 The post Ohio IAM Local 1297 Ends Strike, Gets Better Deal appeared first on IAMAW.